The girls going back to school has restored order to our lives again. The alarm is set for the same time each day and signals the beginning of a carefully (most of the time) choreographed routine as the five of us prepare for the day ahead. After the unstructured days of summer it is comforting to fall back into well rehearsed routines. I have been thinking of how we mark certain times in our days with little rituals or habits that we depend on to keep us moving along in the right direction. For example I met middle daughter on the stairs this morning, looking as if she was all set to leave. “Have you brushed your teeth” I enquired. “No” she said, explaining that she does that after she had tied her hair back in order to avoid getting toothpaste on her hair. A ritual born of practicality. Sometimes our rituals serve to signal a moving from one activity to another. For example, once I know that I have returned to the house for the day and will not be going out again, I generally change into my ‘duds’. This ritual signals to me that I am now relaxing and is probably a hangover from my days when I had a working wardrobe! I well remember sharing my oldest daughter’s ritual for getting ready for a big night out, which is to put on her favourite music at full volume. And I remember that being a great way of getting ready for the excitement that might lie ahead. One of my favourite rituals now is lighting candles. If I am making a serious attempt to write creatively, I will set myself up at the kitchen table, with coffee (practical) and light a candle which serves to calm me and draw my energy to myself in order to plumb my creative depths! At about four o’clock I usually light my kitchen candle as I begin to prepare dinner. 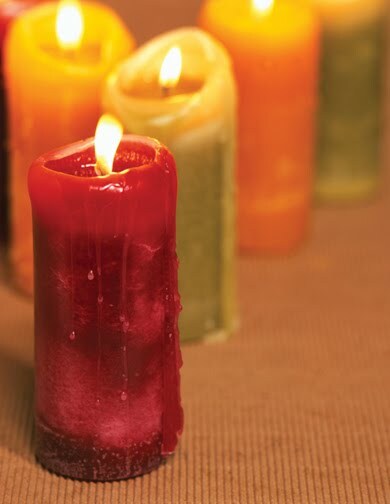 Candle light is a powerful way to instil some calm into the house. As winter draws in, I will also generally light a night light in the hall window to welcome all back to base again! These little, seemingly meaningless habits or rituals, serve to remind us that all is well. They can be great comforters in life. Have you any little rituals that punctuate your days? Are School Friends The Best? When, I read this yesterday I couldn't think of any of my rituals (except like you, changing my clothes when I am 'in' for the day). I heard my computer spring to life as I continued to the kitchen and switched on the kettle and turned on the tap for another cat waiting in the sink (don't ask!). Then on into the main room where J's computer is switched on – I don't have be a contortionist for that! Then I pulled up the blinds, as the last of my three cats tried (as she does every morning) to attack the toggles on the end of the cords. Then back to the kitchen where the kettle is now boiled.